Nothing signals a birthday like our giant layer cake with giant candles. 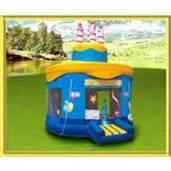 You’ll see this from along ways away and your kids will love the attention they get when you order them a giant inflatable birthday cake to help them celebrate their birthday. Also great for Anniversaries.